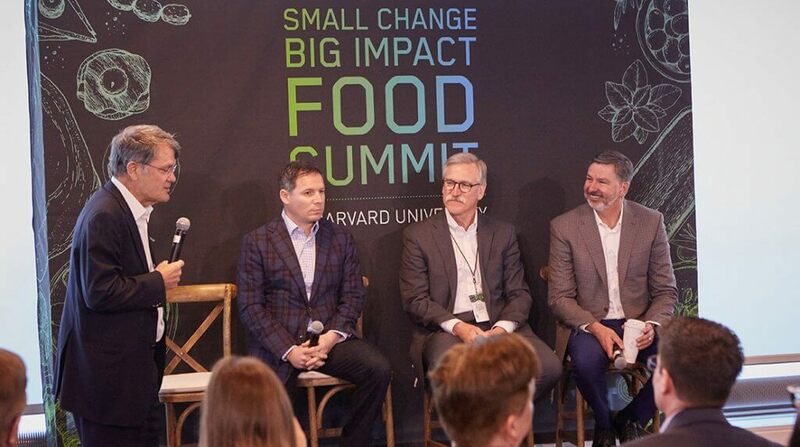 On April 4, industry leaders gathered for several panels at Harvard University’s Richard A. and Susan F. Smith Campus Center to discuss topics ranging from food waste to agricultural innovation at the Small Change, Big Impact Food Summit. The event was hosted by Harvard University Dining Services and Hormel Foods. The problem of food insecurity was a centerpiece of the event, and Greater Boston Food Bank chief operating officer Carol Tienken spoke candidly about the issues facing Massachusetts and the country. “We’re not getting ahead of this problem,” she said. Roughly one in eight people in the United States is food insecure, she said, whereas in Massachusetts, “we have a tongue-in-cheek bragging point — we’re one in 11,” she said. The organization’s goal is to meet all of the needs of the food insecure community by 2028. People who are food insecure are unsure if they will have food or be able to obtain it on a given day. “We talk a lot. We have a lot of meetings. But what’s going to change?” she asked.